Mt. Baker Care Center & Summit Place Assisted Living has been providing personalized care services since 1991. They’re leaders in full-service skilled nursing and assisted living services, offering compassionate care to all their residents. On top of providing exceptional care, Mt. Baker Care Center & Summitt Place set the bar high in terms of waste reduction. They are an active participant in the Toward Zero Waste campaign, and have diverted 80% of waste away from landfill! They recycling and compost as much as they can, and they’ve done amazing work around reducing the amount of waste created in the first place. They’ve implementing resident-centered dining, which allows them to make food to order rather than serve meals buffet style. This has reduced their food costs by 50% and drastically lowered their food waste. They replaced single-use napkins with reusable cloth ones, and they have reusable cups for medicine delivery. They are also one of the very first business to participate in the Squatch Food Waste Food Recovery Initiative in 2018 and have donated 1,658 pounds of good food to those in need. This is the equivalent of 1,326 meals that’s been served at local hunger relief agencies like NW Youth Services, the Miracle Food Network, and the Lighthouse Mission. When it comes to sourcing local, Mt. Baker Care Center is an Eat Local First Participant and has committed to purchasing from growers in Whatcom, Skagit, San Juan, and Island counties. They also look for other local businesses and artisans to buy from and are currently in the process of featuring all local artists as they spruce up their space this year. Finally, Mt. 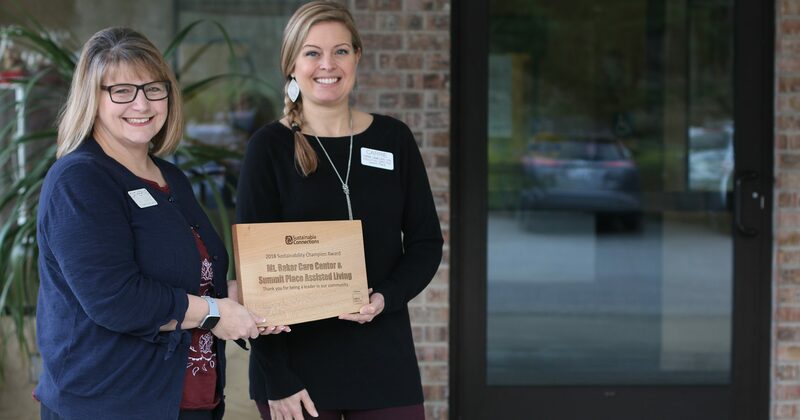 Baker Care Center has made energy efficiency a priority and was an early participant in the Community Energy Challenge. Thank you Mt. Baker Care Center for all that you do for your residents, and your community!